Detector tester spray with kit, etc. The smoke dispenser allows simulated smoke (not supplied) to be introduced to a detector sensing chamber in a safe and effective manner. Suitable for the majority of detectors (up to 100mm/4" in diameter), the smoke dispenser has a test cup that provides a clear view of the detector LED, and its spring loaded mechanism helps to conserve the aerosol and minimise waste. 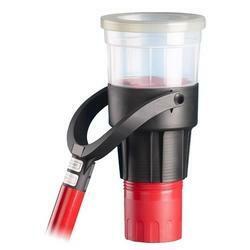 To test smoke detectors installed at a height, the smoke dispenser can be used with a Solo telescopic access pole. With the ability to create various size combinations, the universal detector removal tool is designed to suit the majority of smoke, CO and heat detectors for removal, inspection and replacement. The tool has colour coded grips that simply twist in to place and the universal joint allows the tool to remain parallel with the ceiling. This makes it ideal for the removal of detectors installed in sloping ceilings. 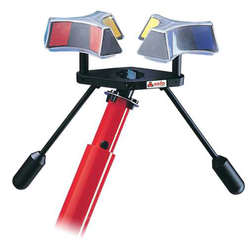 The detector removal tool is to be used in conjunction with a telescopic access pole.